In comparison to a standard floor assembly, a heated floor assembly experiences a greater range of temperatures and is therefore at a greater risk of failure. This makes the presence of an uncoupling membrane all the more vital. 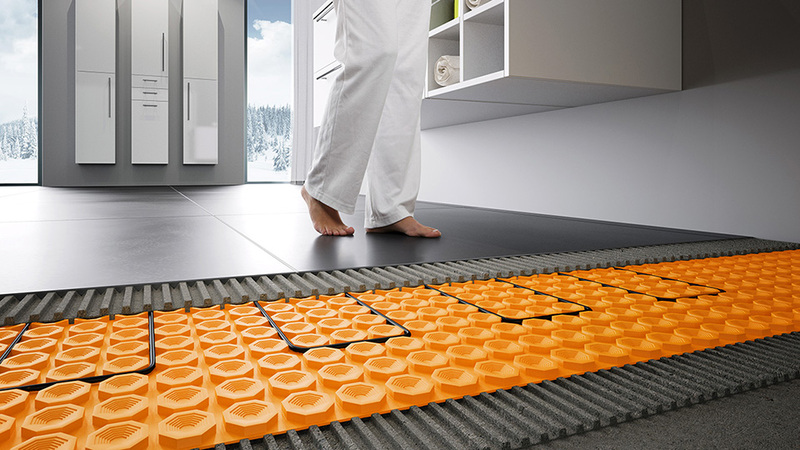 Whereas an uncoupling membrane would have to be installed as an additional layer above a mesh-based electric underfloor heating system, it is an integral part of Schlüter-DITRA-HEAT-E. The Schlüter-DITRA-HEAT mattings share the same great features of the market-leading Schlüter-DITRA 25 uncoupling membrane, and are also designed to hold the electric system cables securely in place, eliminating the need for adhesives. A traditional system can require numerous products, including sound insulation, underfloor heating mat, uncoupling membrane and encapsulation layers; all of which add height to an installation. Not only is the Schlüter-DITRA-HEAT-E system thin in itself, but it also helps to reduce the number of additional layers needed in a heated floor assembly. Schlüter-DITRA-HEAT-DUO is the latest matting variant for the system and boasts impact sound reduction of 13dB as well as enhanced warm-up credentials. This unrivalled functionality comes with a minimal height of just 7.5mm. With the loose cable of Schlüter-DITRA-HEAT-E, you can custom-design heating provision around the features of a room. This means you can avoid heating areas that would never be walked upon, saving electricity. The loose cable also means that you can be more precise in providing targeted heat to certain areas where particular luxury is required. A number of different control options are available for the system, right from a basic analogue thermostat, to our latest smart WiFi-enabled option. The smart WiFi thermostat Schlüter-DITRA-HEAT-E-R-WIFI allows for ultimate control of the system, via the dedicated Schlüter-HEAT-CONTROL app, which is available free for both Apple iOS and Android.